Your enquiry has been sent to David Isaac-George and they will be in touch directly within the next few days. A confident and highly motivated professional consultant. Punctual, enthusiastic and hard working. I will boost your confidence and leave you feeling good. Years of experience within the health and fitness industry, community work and counselling fields enables me to communicate with people on all levels and from all walks of life and cultures. My main emphasis is for people to enjoy their workouts, learn correct techniques, maintain good posture and always be in control of what they do. There is a level of training for everyone, no matter what condition or shape you think you are in and I'll help you find it. I'll help you achieve your goals as long as you do your bit and meet me half way. I can offer you aesthetic type training (which is more to do with wanting to look a certain way, is often carried out in one plane of movement and is the more common type as seen in gyms using fixed weight machines etc.) or functional training (which is training in the three planes of movement our bodies are meant to move in and is more applicable to everyday movements and living) or a combination of both (so you get to look and feel good at the same time). 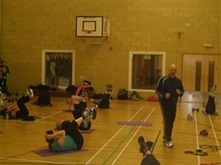 I also offer group training (which can work out a lot cheaper, circuit training, ante and post natal training, exercise for the older person, resistance training, jogging, power walking, cardio vascular machine training and lots more. If you want to know more then what are you waiting for, just get in touch.